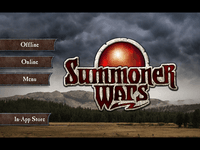 Summoner Wars for iOS is a digital card game with all the tactical elements of a boardgame. The first free-to-play app from Playdek, Summoner Wars for iOS allows players to control the Phoenix Elves faction and battle against AI opponents. Seven additional factions such as the Tundra Orcs, Guild Dwarves and Cave Goblins are available through the game’s in-app store, and online game play access is available after the first purchase is made. Players who have made a purchase can play online games with full asynchronous support. For those who wish to take the game to the next level, a deck-editor allows players to select the cards in their factions, within the confines of the rules. Changing cards can affect game play, making the game infinitely customizable. Summoner Wars is a popular fantasy card game where players take on the role of a Summoner. Players cast spells and summon warriors to a battlefield and tactically maneuver them in an effort to defeat their opponent’s summoner. Summoner Wars offers many faction decks for players to choose from, like the precise Phoenix Elves, the hordes of Cave Goblins, or the righteous Vanguards. Each faction offers unique play and requires players to adapt to the special strategies available to that faction.